The name of this natural site, located in Denizli, a city in southwestern Turkey, translates to “cotton castle.” The area is famous for its natural hot spring water, which cascades down inclines to various tiers, building turquoise-colored pools as it moves. The water leaves behind a carbonate mineral, creating hardened, white salty plains. Unfortunately, many of the magnificent terraces are currently off-limits—having suffered erosion and water pollution—but visitors can still walk down the slope and explore the pools. Just above these thermal salt pools is the ancient city of Hierapolis—a development dating back to the 3rd century BC. Visitors can swim in the Antique Pools, which is littered with marble columns from the Roman Temple of Apollo. Originally a fortified military colony, the city enjoyed great prosperity when the hot springs became a popular spa center. 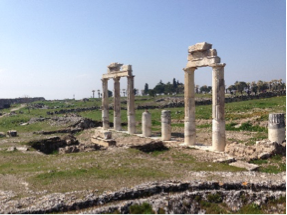 Unlike other ancient cities around the world, Hierapolis feels more like an exploratory walk than a museum. It stretches several kilometers in length with large features dotted throughout—the Hadrian Theater, one of the largest remaining ancient amphitheaters, the Frontinus Gate, and the Nymphaeum. A visit to Pamukkale and Hierapolis is a great addition to any western or southwester Anatolian trip. The ancient city of Ephesus is just a three-hour drive away. That’s a lucky deal, javierbar. These are some of the most popular Turkish tourist destinations, so I wouldn’t be surprised if local vendors tried to take advantage. I think so, too. No complaints here, though—the owner of my hostel in Selcuk arranged for free transportation for me and my mates all the way here. Three hours of driving! For free! Some of the price tag can be managed if you have a local you trust to tell you where to go, but it’s still not cheap, you’re right about that. Pamukkale is one of the greatest destinations in Turkey! I was a bit unimpressed by the town itself, though—everything is really expensive. I think they’re used to international tourists.